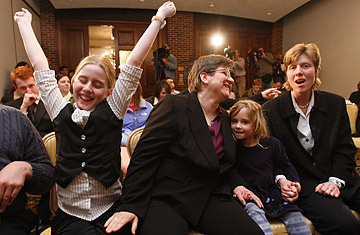 Jen BarbouRoske (R) and Dawn BarbouRoske, with their daughters, Bre and McKinley, react after learning of the Iowa Supreme Court ruling in favor of legalizing gay marriage. Suddenly, California seems so long ago, so far away. When the Iowa Supreme Court ruled on Friday that gays can marry in the Hawkeye State, gay marriage became not just a coastal thing. Deep in the rural heartland, a straightforward opinion  written by a justice appointed by a conservative Republican governor  methodically eviscerates one argument after another that for decades has been used to keep marriage the sole preserve of straight couples. "This class of people asks a simple and direct question: How can a state premised on the constitutional principle of equal protection justify exclusion of a class of Iowans from civil marriage?" Justice Mark S. Cady asked. The decision came at a pregnant moment in what has become one of the defining legal battles of our time. It offers hope to supporters of gay marriage just when they were feeling lowest. Last year's ruling by the California Supreme Court issued a broad new justification for gay marriage  the Republican-dominated court declared forcefully that California may not discriminate against gays in any way, giving the ruling more legal force and sweep than any decision of its kind ever has. Thousands of couples flocked to clerk's offices to be wed. Months later, in November, however, that jubilation turned sour, when Californians voted to change the constitution to forbid gay marriage. Soon after, some gay activists from across the country were asking for a time out, arguing that the marriage activists had pushed too fast and too hard  and that the backlash in more conservative states would undo any progress enjoyed in places like San Francisco or Boston. "Marriage was never our issue," one activist from south Florida told TIME last November. "It was thrust upon us by the other side, and they've done a very good job of beating us up over it." But after Friday those calculations look timid. Now three states require full marriage for gays, and Vermont is on the brink of becoming the first state where gay marriage would be made legal by lawmakers, rather than the courts  a significant milestone. The Vermont House passed a law allowing gay marriage on Friday, and the Senate is expected to follow suit on Monday. Gov. Jim Douglas has promised to veto it, but an override fight will quickly follow, probably by next week. There might even be good news in the Iowa decision for gays in California, where activists are fearfully awaiting the justices' ruling on Prop 8, which is likely to be issued in coming weeks. The Iowa decision cited the California case eight times and borrowed its reasoning again and again. That kind of homage from a sister court  and one that, like California's, has a long history of breakthrough civil rights decisions  may strengthen the resolve of the majority in the Golden State and turn aside the narrow vote of the people. But for now, the power of the Iowa decision can be measured on its own terms. It did not speak with the historic sweep of the California court, perhaps because the justices there know Iowa's court is less often seen as a harbinger of legal trends than California's. And in one important aspect the decision stopped short of following California's lead. In California, Chief Justice Ronald George declared that from now on, any laws that discriminate against gays in California are presumptively unconstitutional and will be subject to "strict-scrutiny" analysis by the courts  a burden that is reserved in every other state for cases involving discrimination against religion or immutable characteristics such as race. By extending it to homosexuals, the California court made clear in a way that no other state court has that gays are deserving of fundamental protections. The Iowa decision's precedent is less forceful. (Read the full decision) Iowa decided, instead, that the statute banning gay marriage fails a subordinate level of constitutional analysis, what courts call "intermediate scrutiny," an approach usually used with cases involving discrimination on the basis of gender, for instance. Because the statute could not even meet that standard, Cady ruled that there was no need to decide whether a higher level of scrutiny should be required in the future. See more about gay marriage.